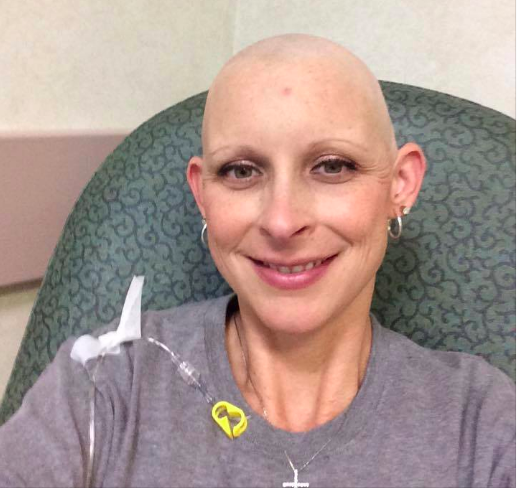 “I began doctor’s visits with the oncologist, the surgical oncologist, and then the plastic surgeon. I truly believe that God gave me the opportunity to be surrounded by the best and I owe those 3 women my life. “I began to lose my hair the day after my 2nd treatment. I was at work and ran my fingers through my hair and it came out in clumps. That night my husband shaved my head for me and my 2 oldest boys shaved their heads too! I didn’t wear a wig, too hot and just didn’t feel like me. “I learned very quickly how people can come together in support. My neighborhood and friends provided my family meals 3 times a week for 4 months. My family members took me to chemotherapy, doctor’s appointments, and helped with my 3 boys. Fellow survivors that I didn’t even know reached out to me to help me through this journey. The diagnosis was devastating, the treatment debilitating at times, but the support I received was beyond what I could have ever imagined.